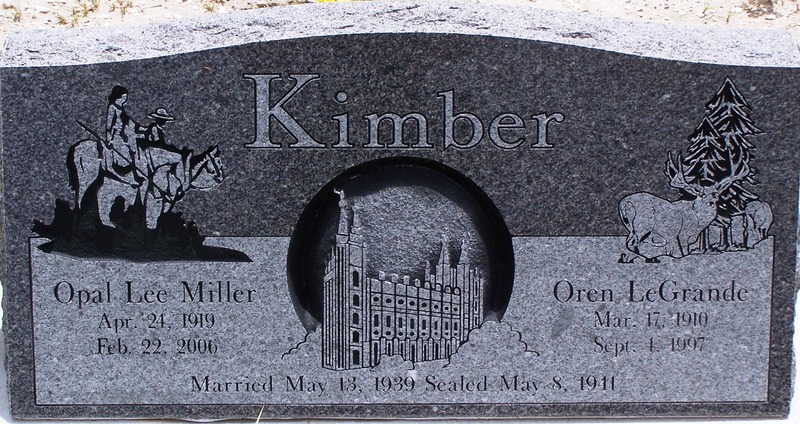 I was born in a very small house on Grandpa William Miller’s property, a little way from the main house in Penrose, Box Elder County, Utah, on April 24, 1919, the second daughter and second child of Clarence Eugene and Ida Adella Owens Miller. My sisters were Lena, Merle, Olita, Carma and Lois. We seemed to move a lot when I was very young. Daddy had a good team of horses (I think they were sorrel Bollies that were huge, white-footed and so pretty) named Snap and Bill. He hired out to haul beets with the wagon and team so he was away a lot. 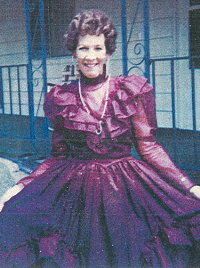 We lived in part of Mrs. Effie Harmon’s house on the north part of the town, when I was around two years old. That house is one of my earliest recollections. Then we moved to a little house on the south side across from Aunt Bessie and Uncle Wilford Miller. It was a small two-room home with a built on back room. We lived in Uncle Lew Miller’s house, too for a winter or so. Next, I remember living in the little blue house at the end of main street. Up through the beet patch and the orchard, we could get to Grandpa’s back door. Primary was the joy of my life. Lena, my sister, and I usually sang a song for the program. I stood on a chair and sang alto at age four. I guess that’s why I remember how I cried because I still had one chicken pox on my neck at the back so I couldn’t go to Primary. One time, when Dad and Mom weren’t home we stayed up to Grandpa’s and Grandma’s. Aunt Relia was watching us and we played down in the orchard. We saw a team and wagon stop at home so we hurried to tell her. We followed her down and an old Indian was carrying bottles of fruit from our cellar. She gave him some bread, too, and they left, peaceful enough, but we were frightened. Another time was when Aunt Bessie’s kids and ours stayed alone and decided to go back over to our house. It was getting quite dark and a lane separated their fields from ours. As we started to get through the fence we could hear horses coming and see lights. A tough gang of boys had lined up on the hill, lit torches and galloped down through the lane. We all hid in the ditch so they wouldn’t see us. It is still very clear in my mind. Then Daddy bought Rowher’s place up in the middle of town on main street. During this time Daddy took our team and beet wagon and went out to work with Uncle Wilford. While they were gone, Aunt Bessie and her family stayed with us and then we’d stay with them. 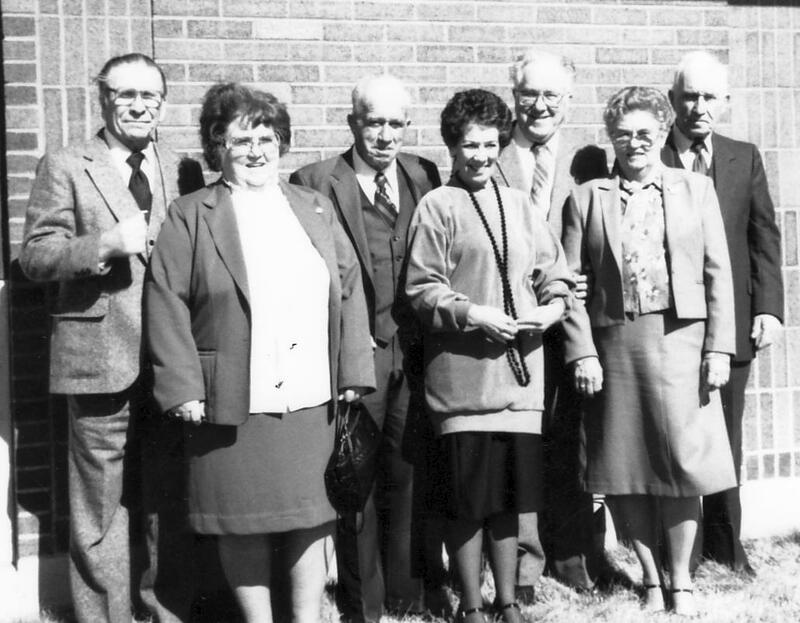 We had much in common with Uncle Wilford and Aunt Bessie and their family. Their children were the same ages and we had the same likes and dislikes. We had so many good times together with a candy pull or games or plays and we were very close all of my young years. Mom and Aunt Bessie would entertain us of an evening. They would hang up a sheet and stay behind it with a lamp and we sat in rows on chairs like a theater. They would dress up in some pretty unusual garbs and take all the parts, changing costumes and singing songs. Their shadows would be on the sheet like a screen you see movies on. There was always a villain, hero, etc. We screamed and clapped our hands and laughed. It was a perfect silhouette and really quite good, I think. We were thrilled to death. On the Fourth of July our families always celebrated together, when we were young. Aunt Bessie and Mom made the tastiest ice cream ever. Daddy bought fireworks which he set off himself, because he didn’t want anyone to get hurt. We helped freeze the ice cream, turning the handle and arguing who could lick the “dasher” (the paddle in the middle that made the ingredients kept moving so it was smooth). It was a glad holiday. Christmas was fun, too. There was hot chocolate for breakfast and about what we wanted to eat; pies, cakes, and candy, too. The wood stoves were so hot that they had red spots from the heat. There was singing and for dinner, roast turkey and chicken, dressing, etc. I don’t remember lots of gifts and packages to open, but I got a lovely big doll. How proud I was of that doll. I still have it. It has dark hair and pink clothes. It is so pretty but old now. One of the happiest Christmases I can remember as a child, was one when times were hard and our parents didn’t have much money. My mother had waist length dark brown hair and she took some to fix hair on our old dolls and made them new clothes. We loved them more than some bought from a store. Memories of such love and kindness and the Spirit of God in our home is priceless to me. When I was four or five, Daddy got a job with Lindsay Land and Livestock Co. at Connor Springs Ranch, five miles southwest of Penrose. (Later it was Browning’s Bar B Ranch.) We moved in a wagon. I remember we were excited but tired by the time we got there. We stayed for thirteen years. Daddy was Foreman. They owned a lot of cattle (several hundred head) and four “bands” of sheep which is over 4,000 head. Mom cooked for the hired men, sometimes thirty-five or more for a meal. We did lots of dish washing and cleaning up early in the morning before we went to school. We did lots of cooking too. We carried water for dishes, etc., and the water to drink was hauled from Penrose in cans. Minerals in the water there at the springs had such a strong taste that we could not abide it. I remember riding in a white top, two-seated buggy to church meetings. The roads weren’t too good either. I remember going with Grandma Miller and my mother visiting teaching in a black one-seat buggy. It usually took all day. Lena and I rode a horse five miles to school (until it was too cold), carrying our clothes in saddle bags. Winters we stayed with Uncle Ray, or with Grandpa and Grandma Miller, and then walking three fourths of a mile to school. Whenever we have a particularly cold spell in winter, I think of the years as a child in the wintertime and I wonder how we made it through. In those days the snow was deep and there were no snow plows, etc. No one fixed the roads anytime. The snow was so deep it drifted over the fences. It was beautiful, just a huge, glistening, white world. But I must be getting soft because we had no furnaces nor oil heating stoves even and none at all in the bedrooms. There wasn’t any water pipes or plumbing to freeze either but in the provincial area it was rugged. Towns, of course, could boast of these things for comfort and convenience but they weren’t present in my growing years. As a child we had a “dolly” washer. The dolly in the center went round and round to clean the clothes, like an agitator. It had a hand wringer which I found impossible to turn so Daddy helped. The first train I remember riding on was a trip to Pocatello, Idaho to see Mama’s cousins and families. The smoke from the train and cinders came in through the windows and made us all black. I was baptized on my birthday in a slough by Uncle Morgan’s farm. The water wasn’t too deep so they had to put me in twice. Our Ward Teacher, Edmund Shuman baptized me. When I finished fourth grade, they made some changes in the Penrose School. I attended McKinley School in Tremonton in fifth grade. The next three years I went to Bothwell School. I got rheumatic fever when I was in the sixth grade. I was in such pain. Dr. Luke didn’t know what to do so we waited until it went away. I graduated from High School. When I graduated there was not enough money for me to go to college or on a mission. In the spring, as we grew older, Daddy would bring a lot of little lambs home, called “bum” lambs. They would die otherwise, so we fed them on the bottle. Then we sold them in the fall so we’d have school clothes. We always had a garden for fresh vegetables. There were pigs on the ranch and chickens and milk cows. We had plenty of meat, milk, cream, eggs, etc. There was fresh watercress by a spring just a little west of the ranch house. We attended church at the Penrose Ward which was five miles away. Daddy was in the Bishopric for thirty years and we were unable to get through the snow at times. We held many positions and attended many of the social gatherings and enjoyed it all. I remember when the Penrose chapel burned down. It was New Year’s Eve, 1927. There had been a dance or some such thing for adults and as we were not allowed to go Aunt Aurelia put us to bed at Uncle Ray’s home. We watched the fire from the bedroom window. Aunt Aurelia stayed with us and kept us quiet and from worrying. When the new church was built, President Heber J. Grant came to dedicate it. We all waited to shake hands with him and it was a great thrill. I was nine years old. In 1931 when I was twelve, I started singing with the choir. I’ve been doing it ever since, fifty years. Music was an important part of our lives. We always sang when we traveled. It is a happy memory. After we left the Bar B, Daddy remodeled the blue house. He had added two rooms earlier but now he arranged a hall and a modern bathroom. It was the first one we’d ever had, and it was a great convenience for us all. Daddy suffered a bad heart attack and we nearly lost him so we moved up to Penrose in our small house. That was about 1938 or 1939. I was nineteen and I had spent one summer in Salt Lake. 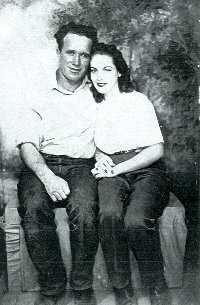 I started dating Oren in the late fall of 1938. Before that I had just seen him at mealtimes or at the dances. By Christmas we were talking of marriage. He gave me a nice box of candy for Christmas and an engagement ring for my birthday on April 24, 1939. 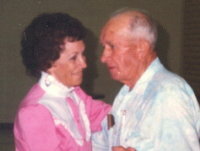 We were married on May 13, 1939. He worked for Brownings “Bar B” Ranches, training horses and helping with the cattle. They gave us a newly painted sheep camp to live in during the Summers when they moved the cattle to the summer range, which was the “Four Mile” ranch south of Logan and Avon or Monte Cristo or Pine Canyon and Eden. In winter we lived at the Fort or (“Brown’s ranch) or Roselle on the west side of Promontory mountains. 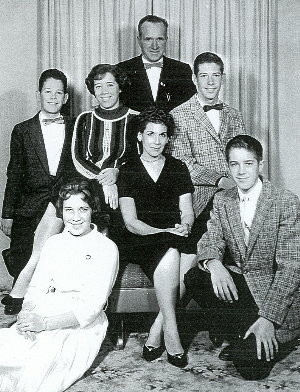 Our children are Joetta, Karla, Oren LeGrande, Terry and Randy. When Joetta was two months old Oren quit the Bar B and we moved to Grouse Creek. 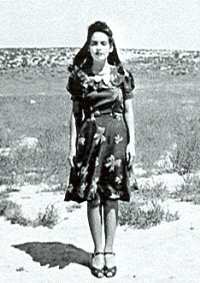 Joetta lived with Fern and Bill Shaw when she went away to finish high school but she got so homesick I moved to Brigham with the kids so they could finish school. Oren stayed at Grouse creek for two years then he moved into Brigham with us and worked in Brigham City. Later he got a job at D.D.O. in Ogden so when Randy finished high school I got a job there also. A sad time in our life happened when our son, Terry, was killed in Vietnam. After this we moved back to Grouse Creek and lived until Oren’s health got very bad. We were happy when Randy found us an apartment near him and his family in Brigham City in 1993. We lost Oren on September 4, 1997. Opal passed away on February 22, 2006 and is buried in the Grouse Creek Cemetery in Grouse Creek, Utah.